Your thyroid is a butterfly shaped gland in your neck. It’s main purpose is to regulate metabolism by converting food to energy. The thyroid gland uses iodine from your bloodstream to make thyroid hormones. It is controlled by two other glands called the pituitary gland and the hypothalmus. Disorders of the thyroid can be attributed to: Too little thyroid hormone (hypothyroidism), too much thyroid hormone (hyperthyroidism), abnormal thyroid growth (goiter), thyroid nodules, and thyroid cancer. Below are some of the most common thyroid disorders. Blend all ingredients in a juicer or blender. Hypothyroidism: Hypothyroidism is a common condition characterized by too little thyroid hormone. 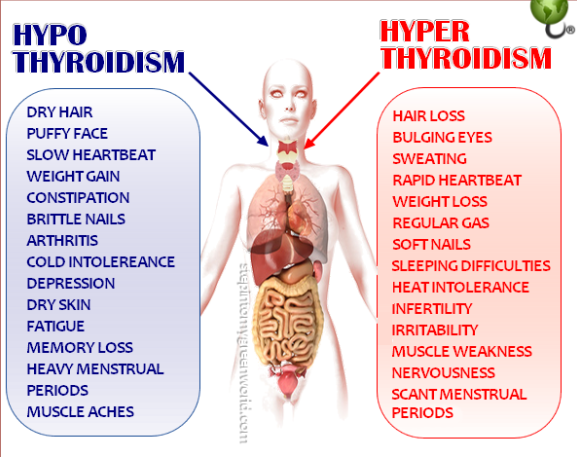 Symptoms of hypothyroidism include, fatigue, weakness, intolerance to cold, dull, dry skin, thinning hair, coarse, dry hair, weight gain or difficulty losing weight, constipation, memory loss, depression, and loss of libido. Hypothyroidism often goes unnoticed, sometimes for years, before being diagnosed. It has three general causes. The first is long term inflammation of the thyroid gland which reduces its ability to make thyroid hormone. The most common cause is an autoimmune thyroiditis called Hashimoto’s Thyroiditis. The second cause is a mechanical hypothyroidism, meaning the thyroid gland was either removed or damaged by radioactive iodine treatments. A rare cause of hypothyroidism, can be pituitary gland dysfunction. If the pituitary gland does not secrete enough thyroid stimulating hormone (TSH), the thyroid does not know to make T3 and T4. In this case, the actual thyroid gland is normal. Hyperthyroidism: Hyperthyroidism is caused by too much thyroid hormone being made by the thyroid gland.. Symptoms of hyperthyroidism include nervousness, anxiety, rapid heartbeat, excessive sweating, sensitivity to heat, hand tremors, sleep issues, increased appetite and hyperactivity. Some people develop fatigue, which is associated with the body’s increased metabolism. Graves Disease is an autoimmune type of hyperthyroidism. The nodules in a Toxic Goiter can cause an overproduction of thyroid hormone as well. Hyperthyroidism is diagnosed through blood tests, an ultrasound and possibly a nuclear medicine scan. It is treated with medication called methimazole. Radioactive iodine therapy is also a treatment choice. Thyroid removal through surgery can also be done. A medication called propranolol is sometimes prescribed to alleviate the symptoms. Goiters: A goiter is basically an inflamed thyroid gland that causes a bulge in the neck. A toxic goiter is associated with hyperthyroidism, and a non-toxic goiter is caused by iodine deficiency. Because the thyroid sits right in front of the trachea (windpipe) and esophagus (food pipe) when it enlarges it can make you cough, especially at night, or feel like food is stuck. Treatment is either observation, thyroid pills or surgical removal. Thyroid nodules: Solitary nodules, or lumps, in the thyroid are quite common. It is estimated that more than half the population will have a nodule on their otherwise normal thyroid. The great majority (>95%) of nodules are benign. Most nodules do not have symptoms. Sometimes you will see or feel a lump on your neck. An ultrasound can be done to identify the appearance of the nodule. Usually a fine needle aspiration biopsy (FNA) will determine if the nodule is cancerous. Thyroid cancer: Thyroid cancer is fairly common, and the long-term survival rates are excellent. Thyroid cancer can affect anyone at any age, though women and people over thirty are most likely to develop it. Symptoms include thyroid nodules, hoarseness, neck pain, and enlarged lymph nodes. An ultrasound can be done to try to identify the appearance of the nodule, then a fine needle aspiration (FNA) biopsy is done to confirm the diagnosis of thyroid cancer. Thyroid cancer is treated by removing the thyroid, then using radioactive iodine to kill any remaining cells. Because your thyroid has been removed, you will need to take thyroid pills for the rest of your life. Thyroiditis: Thyroiditis is an inflammation of the thyroid that may be associated with abnormal thyroid function (particularly hyperthyroidism). Inflammation can cause the thyroid’s cells to die, making the thyroid unable to produce enough hormones to maintain the body's normal metabolism. There are three types of thyroiditis, and the treatment is specific to each. Hashimoto’s Thyroiditis is the most common form of hypothyroidism. It is an autoimmune thyroiditis and is treated with levothyroxine. Thyroid “antibodies” are positive in people with Hashimoto’s. In De Quervain’s Thyroiditis, the thyroid enlarges quickly and is painful to touch. You quickly become hyperthyroid and most people get fever and feel ill. In most people, it goes away without intervention, some people need a course of steroids to calm the inflammation down. Silent Thyroiditis is not very common. It is a combination of Hashimoto’s and De Quervain’s without the symptoms. It often goes away within 3 months. Sometimes propranolol is given if the patient has palpitations.